I first tasted the wines of Lise & Bertrand Jousset at a small wine event organized a few months ago at L'Ebauchoir, a wine restaurant in the 11th in Paris (see the 3rd story of this post). The tasting was centered on the production of the younger vignerons of the Montlouis Appellation and you could taste both the dry and the sweet Chenins along with enjoying the great food of the place. The Joussets wines were definitely among the ones I preferred that day, very pure and elegant. Lise and Bertrand Jousset are a young couple who are very active in the regenerating new-blood group of the young vignerons of Montlouis, an Appellation most of us know through the names of people like François Chidaine and Jacky Blot who have already made a good job to put Montlouis on the map. 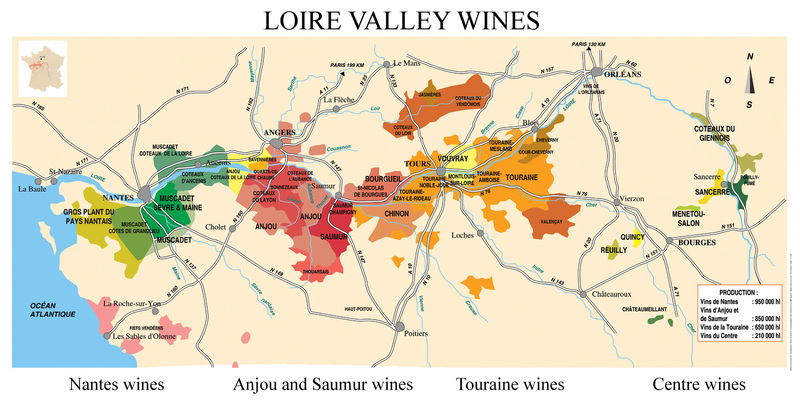 Montlouis is Chenin country, along with several other Loire regions like Vouvray, Savennières, Coteaux du Layon and Jasnières. The Chenin variety is not outwardly aromatic like some other, easier variety, plus it is more fragile because of thin skins. In this interview of Eric Morgat [in French], another young talented winemaker from Savennières, we learn that to get a beautiful Chenin wine you must get a ripe harvest without excess, low yields and long élevages. He says that Chenin is more a variety underlining terroir than an aromatic variety. Bertrand confirms that this variety ripes later, like around the 10th or 15th of october, at a time when the weather is not always good, which brings uncertainty every year. The skins become soft when the harvest nears and if it rains then, problems can occur. But with this variety, the vigneron can make different types of wines, dry, sweet and with the in-betweens, and if well-managed in the vineyard, you get very pure wines which age beautifully. Lise & Bertrand Jousset First, this is a couple's story, Bertrand says that Lise plays a role as important as his. They created this winery in 2004. Bertrand had been working here and there in different wineries of the region after a training in viticulture. He was in Vouvray then and Lise was sommelière in Paris, they didn't see each other very often. She was on the verge to take a job position in Montpellier (he would have followed her there) when a friend of his told him at the end of 2003 that there was a small estate for rent in the Montlouis area with good potential. It was a bit early for them, they didn't initially intend to start their own winery so early but the opportunity was too good. They visited the place, the house on the top of the cliff overlooking the Loire, the facility and its multi-story gravity situation, and very important, the vineyards. The estate was too good an opportunity to let it pass and they signed up. Loire-river side : to the cellars - débourbage room on left They began with renting the estate (including the vineyard, the facility and the house) and now they're in the process of purchasing the vineyard this winter because on the long term it's the best option. The vineyard surface was 9 hectares when they took it over. Bertrand Jousset had then a good experience of the work in organic vineyards, he used to do the vineyard tasks for several such wineries. He had also worked for a conventional winery which allowed him to see the other side of the coin. He says with a smile that he fled away with relief... He got his formal training in a viticulture school Amboise (Loire), where he attended a two-year cursus named "Conduite et Gestion d'une Exploitation Agricole" in 1998 & 1999. The cellar doors After his training, Bertrand worked mostly in the vineyard, not in the cellar. The vineyard side was what interested him the most. And even now, he doesn't "work" on his wines in the cellar, he concentrates all his energy on the vineyard management side, organic of course. The first place where he worked after the school was at Michel Augé who at the time was working at the Coopérative Viticole. The early years of his new winery were very difficult and they almost closed down in 2008. Lise worked night-shifts in a nearby factory on weekends during the 3 first years so that they could have something to eat every day. The biggest difficulty was that they started without money of their own, plus there was the métayage (rent) to pay every month, which put a heavy financial pressure on their beginnings, especially that they had very low yields. The vineyard was previously farmed conventionally, that is with chemical sprayings, and when you turn a vineyard overnight toward organic farming, yields tend to fall dramaticly in the first years. In 2008 they happily could rework the loans and the pressure was somehow eased, especially that in 2008 and 2009 they had yields back above 30 hectoliters per hectare. The fact that they'll soon own the vineyards will also make their functioning smoother. Walking between the rows The house overlooking the valley, the facility and the cellars were beatiful, but the vineyards were certainly central to their decision to set up shop here. The vineyards were mostly planted with old vines, which is by the way the reason why the conversion to the organic farming was more arduous : the old vines take longer to adapt and recover from the change shock. 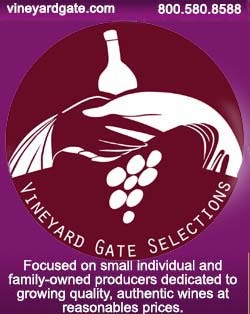 Bertrand had chose to turn all the plots organic almost immediately after the start (in 2005) even though he knew the shock would temporarily slow down considerably the grape production. The yields fall was sharper than expected and also they had lots of hailstorm losses in 2005 which added to their ordeal, but now it's an old story and the vines live safely in a healthy environment, allowing Lise and Bertrand to craft the wines they like. Bertrand is still cautious, saying that even if things are better today than, say, in 2007, they still aren't sure of their immediate future. He adds that they'll feel more secure in 2012, by then, if no accident occurs, things should really get better for their small winery. The deep underground tuff cellar Most of the vineyards that they work on are located near Husseau on the plateau, with 80 % being just on the other side of the small road near the winery. The rest including his Chardonnay sit near Saint Martin le Beau, a village not far from here. They even have a pre-Phylloxera Chenin vineyard with which they make sweet (moelleux) or semi-sweet (demi-sec) wines. Today, they work on 10,5 hectares in all, of which 8 hectares of Chenin and the remaining 2,5 hectares being planted in Gamay, Cabernet Franc, Grolleau, Chardonnay and a little bit of Cabernet Sauvignon (he's uprooting it soon, it doesn't ripe here). THe average age for the whole of his vines is 60 to 70 years, and Bertrand says that it is the main reason why they could produce wines which stood out. THe downside is that the previous owner never replanted vines to replace the dead ones and there are many missing, so he began to replant every year but there's still lots to do in this regard. He replanted clones on Riparia vinestocks in one of his plots which was planted with clones, and for the rest, he made his own massal selections from his Clos Renard and La Vieille plots, that he will use for all the other replantings. He made his selection very seriously, along 4 years, starting with 300 vines and narrowing on 30 vines. In one of the tuff tunnels His vineyard is fully organic from 2005 but he didn't ask for the certification at the beginning because he saw this organic stamp on the labels like a fancy marketing tool and he didn't want to be part of this. Now he is beginning slowly to adopt biodynamy as well. Asked if he learned biodynamy with Michel Augé, Bertrand answers that when he worked with Michel, he was still the director of the Coop and he was in the process of leaving the coop to make and bottle his wines himself, taking also the organic way and testing biodynamic methods. For his vineyard work, he had to buy a tractor and several tools because the previous vigneron didn't farm the same way that he would. Typically, the grapes are picked by hand in boxes, there's no sorting table, all the sorting takes place on the vine and in the buckets before they're poured into the boxes, the goal here being to avoid damaging the grapes on a table. Because of this double sorting, the picking takes more time than elsewhere. After pressing the Chenin, there's a settling of the lees (débourbage) in the intermediary chai on a lower level (see one of the pictures above, near the stairs) and the wine is flowed by gravity into the casks further down in the tuff cellar. The fermentation takes place on indigenous yeasts in the barrels, no intervention there. Lise and Bertrand make about 12 cuvées every year, 7 of them with Chenin, 2 sparklings, 2 dry wines, 1 demi-sec, 1 moelleux and a liquoreux. They also make a Cabernet Franc/Gamay red wine named Y a Rien Qui Presse, a 100%-Chardonnay, a natural sparkling made with Gamay & Grolleau, and a still rosé with the same varieties. There's not much to say about the cellar work, says Bertrand with a laugh. Still, he says an interesting thing about his cellaring of the wines : he brings his dry wines to the end of their fermentation in the casks but he doesn't want the whole élevage to take place in there, so when the alcoholic fermentations are completed, which can last one year or one year and a half in some extreme cases, he blends the casks of a given cuvée in a vat where they'll have their élevage if necessary, but he doesn't want any élevage in wood. Chenin from the cask They had also to buy all these casks in the early years as well as the vats. The three-story situation of the facility was as said a high point of this winery, allowing to use gravity between the stages and storing the wine in a cool atmosphere with a good humidity level. Back to the élevage : No rules about the length, he just avoids it to take place in wood. If he could financially, he would make longer élevages than now, and he hopes to do that in the future. For the SO2, he adapts his use of it on the vintage. What he likes to do is to put a gram or two at the setlling of the lees, it allows him to make a slight intervention at this stage as he doesn't have any cold-temperature system. What he wants to avoid through this light adding is the wine to go toward primary aromas. Then he adds a bit of sulfur when he blends the wine into a vat, but not at bottling itself. This makes for dry wines an average of total SO2 going from 50 for easier vintages to 80 for the more difficult ones, which is very low and makes almost nothing in free SO2 in the bottles. I alas didn't take notes this time but I'm looking forward to the next tasting of their wines in Paris or elsewhere to correct that and pay tribute to their work on Chenin. The wines are exported to Canada (Quebec - Rezin), Belgium (Jacques Delire Vins Fins), the UK (Vine Trail), Holland (de Winjtherapeut), Japan (Izumi Trading), Spain (Lavinia), Italy and  to the United States (Return to Terroir).